The 2014-2015 school year in Fayette County has come to a close. 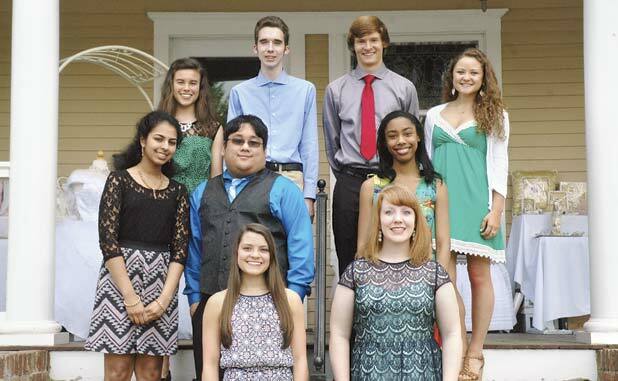 And with the end of the school year it is time to take a look at the valedictorians and salutatorians at each of Fayette’s five public high schools. Each of the valedictorians and salutatorians were asked a number of questions by the school system. Several of those questions and their responses are included below. The Fayette County High School Valedictorian for 2015 is Janeen Thomas, daughter of Santhosh and Rachel Thomas. Janeen will be graduating with a 4.395 grade point average and will be attending Yale University with a major in biology/pre-med. Janeen will receive the National Merit Eaton Scholarship and the Walter G. Harrison Scholarship. Janeen was asked if she ever thought she would represent her class when entering high school. “I never thought I would represent my class as valedictorian when I started high school because I did not even know about being valedictorian. When I did learn about the honor, I never imagined I could achieve it,” she said. Asked about her favorite high school memory – “I have many great high school memories, but my favorite one is probably being a part of Who’s Who for my class. We missed school to take pictures and have lunch. I had an amazing time with my friends, and the lunch was scrumptious,” Janeen said. The Fayette County High School Salutatorian for 2015 is Edward Legaspi, son of Elinor Legaspi. Edward will be graduating with a 4.0 grade point average and will be attending Auburn University with a major in business administration. Edward will receive the Hope Scholarship, Zell Miller Scholarship and Auburn Charter Scholarship. Edward was asked if he ever thought he would be representing his class when he started high school. The Whitewater High School Valedictorian for 2015 is Jamie DeCicco, daughter of Christine DeCicco. Jamie will be graduating with a 4.0 grade point average and will be attending the University of North Carolina at Chapel Hill with a major in biology. Jamie will receive the Whitewater High School PTSO Scholarship. Jamie was asked if she ever thought she would be representing her class as valedictorian when she entered high school. “When I started high school, I never really thought about becoming valedictorian. I didn’t really picture myself as a contender whatsoever. I always just try to do my best in everything I do, and as a result, my hard work has paid off,” she said. Jamie also spoke about her favorite high school memory. The Whitewater High School Salutatorian for 2015 is Kathryn (Kate) Lewis, daughter of Tony and Sonya Lewis. Kate will be attending Berry College with a major of neuroscience/pre-med. Kate will receive the Whitewater HS PTSO Scholarship, Provost Scholarship, Winshape Scholarship, Berry College Music Scholarship, Mercer University Music Scholarship, Veterans of Foreign Wars Voice of Democracy Certificate of Merit, Penfield Scholarship, North Georgia Academic Scholarship and Zell Miller Scholarship. Kate was asked if she ever thought she would be representing her class as salutatorian when she began high school. The Sandy Creek High School Valedictorian for 2015 is Taylour Howell, daughter of Millette and Reginald Howell. Taylour will be graduating with a 4.0 grade point average. She has not decided on the college she will be attending. Taylour will receive the Ron Brown Scholarship and National Achievement Scholarship. Taylour was asked about her favorite high school memory. “Other than binge-watching episodes of Celebrity Apprentice, my favorite high school memory has to be spending time with my best friends in and outside of school,” Taylour said. The Sandy Creek High School Salutatorian for 2015 is Preston Earle, son of Greg and Cheryl Earle. Preston will graduate with a 4.167 grade point average and will attend Mercer University with a major in pure mathematics. Preston will receive the Mercer Presidential Scholarship. Preston was asked about the key message in his commencement speech. “We are all called to love; we are all called to serve. In order to be successful, we must find our vocations bristling with love and ordered towards service,” he said. Preston also had thoughts on the honor of being named salutatorian. Asked about his favorite memory of high school, Preston said it was Spanish IV. “There never was a class so versatile, interesting and hilarious,” he said. The McIntosh High School Valedictorian for 2015 is Alex Tchaykov, son of Diliana Panova and George Tchaykov. Alex will attend the University of Georgia with a major in music, English and philosophy. Alex will receive the Zell Miller Scholarship and SMAMTA Piano Scholarship. Alex also shared his perspective on his favorite high school memory and the highlight of his senior year. The McIntosh High School Salutatorian for 2015 is Tarna Zander-Velloso, daughter of Elizabeth Zander-Velloso and Victor Velloso. Tarna graduated with a 4.318 grade point average and will attend Yale University with a major in environmental studies or international studies. Tarna also gave her thoughts on the honor of being named the school’s salutatorian. The Starr’s Mill High School Valedictorian for 2015 is Emma Wernecke, daughter of Mary and Bill Wernecke. Emma is graduating with at 102.833 grade point average and will attend the University of Notre Dame with a major in business. Emma is a National Merit Finalist and will receive the Miss Starr’s Mill High School Scholarship, State Farm Leadership Essay Scholarship and the Miss Georgia’s Outstanding Teen Scholarship. Emma said the best advice she received came from her dance director. Emma also commented on the honor of being named valedictorian. Emma said the highlight of her senior year dealt with her participation with the school’s yearbook. “This year, I have had the honor of being Editor-in-Chief of the yearbook. The countless hours spent with my co-editors pouring our hearts and souls into the creation of a final product we could be proud of were so worth it. I can’t wait to look back in 20 years and remember all the memories that we captured from our senior year in high school,” she said. The Starr’s Mill High School Salutatorian for 2015 is Cody Clements, son of Curt and Zena Clements. Cody will graduate with a 4.286 grade point average and will attend Yale University with a major in molecular, cellular and developmental biology. Cody has received scholarships from the University of Alabama, Presidential Scholar, the Emory University Oxford College Dean’s Scholarship Scholar, University of Georgia One UGA Scholarship and the HOPE/Zell Miller Scholarship. Cody said the best advice he received in high school came from his dad. Cody also spoke about the honor of being named salutatorian.